I have found a blog which covers the construction from August 2009 to September 2011 regarding the progress of our new Queen Elizabeth Class Carriers. This blog has had nothing else added to it however from September 2011. So I will add additional updates to keep the information current about the carriers and their progress. From here we will be able to follow progress regarding their construction and other information which I will periodically update, just follow the links for updates to see how they are progressing. Thanks for the update Mr T, more have now been added. New updates have been added as well as some legacy pieces. There is also a major article by armed forces commentary in the general information page. Damning report finds that HMS Queen Elizabeth and HMS Prince of Wales risk entering service without systems that will warn of enemy planes an missiles..
That'll be the ones with 20-20 vision and the big binoculars who have to stand around the edges of the flight deck then? You couldn't make it up could you! so long as the MP's still get their free bar and food in the commons at ur expense, who cares about the lives of our military, business as usual from the government. If the politicians (if you can call them that) let them get on build the things instead of changing their minds and bickering about the bill etc, they will be finnished and in service a lot sooner. You mean to say that the US Navy isn't the only navy that experiences huge cost overruns, and then expects the taxpayers to foot the bill without complaint? Shocked I am, shocked! The big difference being that the USA numerous carriers. 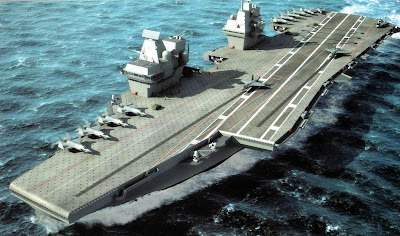 The UK currently has one, which no longer has jet aircraft on board and is being decomissioned in 2014, where we won't then have a carrier on the high seas until the first of the new Elizabeth class carriers are ready for service in 2020. Engineers say important lessons have been learned from 18 days of trials at sea involving Britain’s next-generation jump jet. The F35 Lightning II will provide the punch of the Royal Navy’s two new carriers Queen Elizabeth and Prince of Wales – and will operate from land from RAF Marham. The Anglo-American stealth strike fighter – two generations more advanced than the legendary Harrier it replaces – was put through its paces during its second concerted spell of sea trials recently during 18 days aboard the assault ship USS Wasp off the Eastern Seaboard of the USA. A combined Royal Navy-Royal Air Force team supported the trials – including pilot RAF Sqn Ldr Jim Schofield, who performed Britain’s first day and night take-offs and landings at sea in the F35. While most of the media focus was on what was happening in the skies, equally-important lessons were being learned in the hangar courtesy of a maintenance team headed by Lt Cdr Robin ‘RTB’ Trewinnard-Boyle. said avionics expert POAET(AV) Paul Cummings. He was one of two RN senior ratings – the other was POAET(M) ‘Ronnie’ Corbett – and an RAF armourer, Sergeant Paul Parkinson, who joined Lt Cdr Trewinnard-Boyle on the Wasp. They not only carried out maintenance work on the two F35Bs embarked, but tested loading and unloading dummy weapons in its internal bomb bays (for stealth reasons unlike the Harrier, all the weapons are carried inside the aircraft, rather than slung on pylons beneath the wings). The officer says 'exciting times lie ahead' with further testing – including launching the jet from a ski ramp erected at the airbase. He was involved in the final days of the Harrier as the senior air engineer aboard HMS Ark Royal in 2010, so he’s delighted to be at the heart of the rebirth of fast jet carrier operations. “It was a great feeling to be at the beginning of seeing F35B operating at day and night from one of her natural environments – a flight deck. Here is the latest part to be fitted and some very interesting facts. First captain of the Queen Elizabeth announced.